During the last week I've been reviewing an excellent real estate listing application developed by a realtor in the fast growing market of Boise, Idaho. Bill Clark has worked long and hard and has developed a Google Earth interface which shows more information, and with more accuracy, than any other real estate listing service I've seen to date. Once you visit his Earthpoint listings page for finding listings, you select "Listing Category" ('residential' is default), and then select characteristics you are looking for (e.g. 500,000 to 2,000,000 price range). You then select "Count" to see how many listings you will get. Or, just go ahead and select "Download to Google Earth". 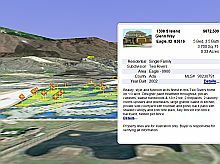 Each listing is identified to roof-top accuracy (if the house is built). And, as with other listings, clicking on a placemark shows more information about the listing, usually a photo, and a link to more info at the web site. But, Earthpoint goes further, the property lines are also drawn (in yellow). Some of the developments have scanned maps overlayed as well. 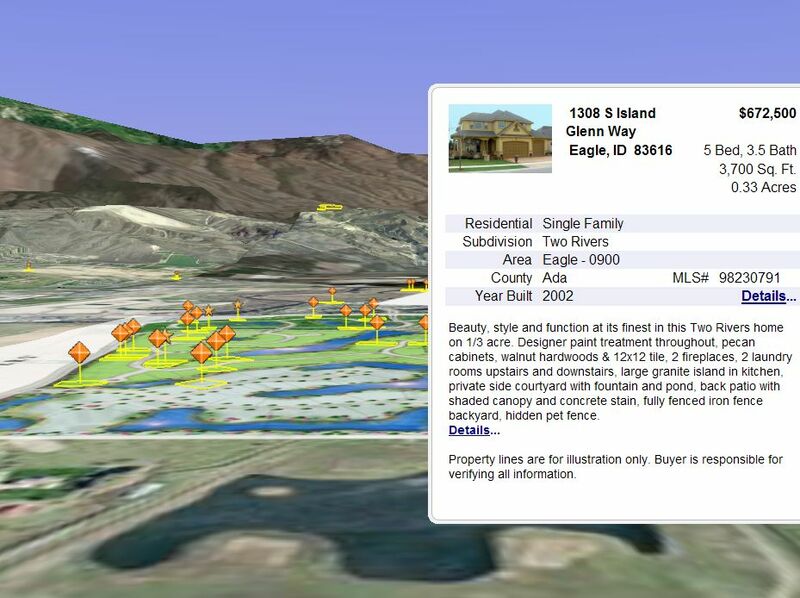 This is more like Geographic Information System (GIS) data than the typical placemark for a listing you see in most listing services. Earthpoint does point out on the page that this information is not guaranteed for accuracy, that the buyer is responsible for checking with legal resources for accurate property layout. But, this definitely helps when trying to understand extent of property and its relation to the nearby environment. So, if you're looking for property in Boise, this is the best way to do it. Excellent work Bill! Yep, Google Earth has my house number wrong too, so when you enter my address it points to a house down the street from me. It must be the same database used by a GPS unit my friend has, which wants to send her to the wrong house too. I see people have had a hard time getting Google to correct this - any thoughts on how to attempt a correction? Thanks. "We're aware that some addresses are not roof-top accurate. This is the result of how addresses are matched up to an exact position on the Earth. We rely on a technique called "address interpolation," which is a fancy way of saying that we take our best guess. More specifically, we take the total number of addresses in a given block and assume an even distribution of the addresses along that block. For example, if there are ten addresses for the 800 block of Main Street, we assume that the fifth address is located at the halfway point. "